It’s almost impossible to start or run a business without considering your data needs. Technology is leveling the playing field by allowing businesses of all sizes to compete as equals. Unfortunately, many businesses lose ground to competitors because they don’t have the time, or know-how, to set up their IT and networking equipment properly. 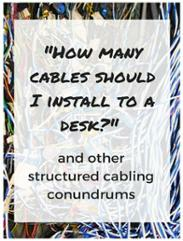 Structured cabling solutions are not one size fits all. No two businesses will have the exact same needs. You may just need to make sure your phone system is in place, and that your Internet works properly. Your needs and equipment will determine what kind of solution will work best for you. Our certified technicians will come out to your location and perform a full, free evaluation of your current infrastructure, and after discussing your needs, will propose a completely custom plan for your building’s structured cabling set-up. This plan is based off of what is best for your current and future cabling needs. Where do you have your equipment? Sitting under a desk or on a shelf? In some other dedicated space? Are there cables all over the place? These are the kinds of questions that can help you figure out what kind of data infrastructure solution you should consider. In general, unless there’s some real reason not to, all of your data and phone equipment should be housed in a dedicated space. That space can be a closet, a room, or some other area. What matters most is that it is accessible and not in anybody’s way. The first thing we’ll help you do is establish your space. A closet or even a sectioned off area can work for a business if there’s only a few pieces of equipment. Most of your equipment will go onto racks or shelves mounted into the wall above the floor. Keep vertical space in mind when choosing the area itself. We’ll pay close attention to where you have both electrical and data outlets. If you choose a space that doesn’t contain an adequate power supply then you can run into problems. This isn’t such a big deal when there’s only a few pieces of equipment, but it can become increasingly worrying as your data center grows over time. You will also have to make sure that you leave space (and power supply) for other devices like fans or an AC unit. Your gear needs to stay as cool as possible with good airflow. No matter where you place your equipment or how your facility is set up, you will need some form of structured cabling solution to keep everything organized. Remember that there are a lot of lines stretching from your data center. Within the area itself, there are many smaller connections. You can soon have a mess on your hands if there is no form of organization involved. 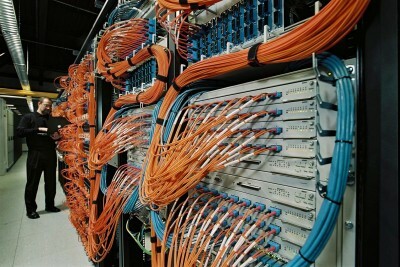 Many people think that structured cabling solutions are only for large buildings and complex data centers. That’s not true. Structured cabling solutions exist for every kind of business, large or small. There has to be some order to your cables so that when it comes time to upgrade or change any detail, it can be done efficiently. There has to be a clean way to differentiate between your Cat6 lines, your cable line, the various power cords, and every other piece of cord that starts or ends in your data center. A few patch panels can get you started, but if you plan for your data needs to grow, then you should plan your cabling ahead of time. If you don’t know where to start, or if you’ve never given any thought to the issue, then you should speak to us about our professional service. Although we’ve worked with Fortune 500 companies, we’re always available to any business that needs our help. We even help organize the most chaotic of cable closets! As a full multimedia company, we can help you figure out how to implement data solutions for your business, plan the most effective placement of your equipment, transition your phone system to a more modern one, and help you plan the cabling for it all.